Aakanksha, notes! : Moving On - The Technology Way. Moving On - The Technology Way. Bill Gates declares the onset of the SECOND DIGITAL DECADE at the 2008 International Consumer Electronics Show(CES) ,since he first introduced & started talking about Digital Decade in 2001,& since then we had seen the Windows XP, come a long way to VISTA & the complete evolution of using a PC as a mere tool for emailing to being a centre for various other devices & managing them .He had a vision & he saw it coming true.Have a glance around & its apparent, technology is a very part & parcel of our lives and he continues to look forward for a future,where he just can't stop imagining and maybe that's what defines the innovators. Thus, we have Microsoft's integrated voice-and-visual mobile service that lets people use voice commands to say what they want and see the answer on their phone's screen using the popularity gaining GPS (Global Positioning System).Imagine talking & instructing your PC. 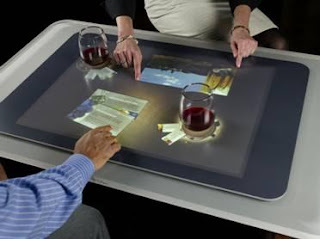 Then there is Microsoft Surface to recognize everyday objects, as the food-pairing recommendations instantly appear infront of you as for instance by simply placing a glass of wine on the display.No chances of confusions & you get the best programmed menu options..!! and various such software which would make people's communication,favourite contents,ability to connect all appear very natural.